In working with some high school coaches this season, this author has become keenly aware of the problem with planning training for a short (12-14 weeks) season coupled with schedules that call for meets in the middle and ends of many weeks. Planning training for this type of schedule revolves around application of proper Sequencing of training components within each day and, more importantly, from day to day. Briefly stated, this means alternating days of Neural Work (Max Speed, Strength/Power) with Energy System Work (Lactate Tolerance). Speed should precede Strength/Power and be coupled in the same day. Elastic Strength can be done prior to Energy System work the day after Speed/Strength (Neural). Aerobic Capacity work (using tempo and/or extensive tempo with either short (100-150m) or longer (150-200m) repetitions can be used for regenerative purposes after Lactate Tolerance Work days or Competition Days. Individual workout plans are best designed by coaches who know their teams well. Each coach should be aware of his/her athletes abilities, recovery capacity, training volume capacity, training intensity capacity, prior injuries, additional stresses (school, home, lack of sleep, poor diet, etc.) and the overall importance of each competition (in terms of training and/or preparation for the League/Section Championships). For this reason, it is not intelligent to “cut and paste” workouts from other coaches, books, etc. for use without tailoring it to the specific needs of the athletes. It is also important that the training plan for the whole season be kept in focus. This means that each week should have an emphasis that is represented by the volume level, intensity level, recovery/restorative volume level, competition level of the athletes within each program. Using these general guidelines to plan for weeks where two meets are scheduled would look something like the examples below. Saturday: Neural/Energy Mix: Speed or Speed Endurance using Race Models w/ low volume and long rests. Easy tempo work following Race Models. Weeks involving only a Mid-Week Meet can also switch the example plans from Friday with those of Saturday OR use the Saturday or Friday examples on Friday and utilize easy Tempo for Restoration/Recovery on Saturdays. Pool work is another great variation of recovery work if a pool is available. Development of proper Sprint Mechanics should be the foundation of Speed Training. Sprints at higher intensity over shorter distances should be used to improve technical efficiency of Sprint Mechanics. Develop of Maximum Speed should done with distances starting at 10-20m and progress to 60m AS athletes show the ability to execute proper mechanics over the entire distance. Speed Endurance work can begin at 50m and progress to 150m, depending on ability to execute proper mechanics. Intensity should be kept between sub-maximum (SE) and maximum (Sp) with athletes allowed to sprint as far as their individual technique allows. High School coaches who are faced with short seasons and Multiple-Competition Weeks need to be as creative as possible to make sure training encompasses a variety of methods to increase motivation and engage the enthusiasm that accompanies the learning of new skills. Training that employs a variety of methods that are rotated in alternative weeks (use of 3 or 4 week block is perfect for this) allows for athletes to be challenged while also creating an environment whereby the athletes can experience improvement in the various training skills that are consistently rotated throughout the season. This mixing of various training modes for Speed and Power into a specific session will serve as an example of how a Neural Training Day can be used prior to a Mid-Week Meet. The following Training Session Plan should involve low volume and long rest periods between reps and exercise modes. Examples of exercise modes, volume and recovery times are included. Athletes rotate through a circuit that involves four stations alternating Speed with Power. Station #1… Overhead Backwards Med Ball Tosses 3 x 2 reps (1st w/no hop, 2nd w/1 hop, 3rd w/2 hops) w/ 1’/reps and sets. Station #2… Block Starts 2-3 x 15-20m w/ 2-3’ rest. Station #3… Counter Movement Box Hops 2-3 x 3 w/ 30”-1’/reps and 1.5’/ sets. Large groups of sprinters can be split into groups of 8 or 9, depending on number of lanes available on track for starts. School with 8 lanes can easily rotate 32 sprinters through the circuit with each group of eight starting at a different station and rotating as a group when finished. Schools with one or more coaches for sprinters have the luxury of making sure the exercises are done in a quality manner with feedback that allows for a learning situation for the athletes. Emphasis on learning to be technically efficient must be a consideration when designing sprint training plans for each day. Young athletes with a lack of training and conditioning cannot be expected to be able to handle Lactate Tolerance Work with proper technical efficiency IF the distances used are those used by traditional LT workouts of older 200/400 sprinters. To allow for mechanical/technical efficiency of young sprinters WHILE doing Lactate Tolerance work needed to prepare them for the 200/400, it is best to use shorter distances run at high intensity w/ short rests. Examples of these types of Lactate Tolerance Workouts are listed below. *Based on Biochemical Evaluation of Running Workouts used in Training for the 400-m Sprint by Saraslanidis, Manetzis, Tsalis, Zafeiridis, Mougios and Kellis, Journal of Strength and Conditioning Research, Vol. 23, #8, 2009. The aim of this article is provide examples of Training Design using Short to Long (Speed Development) and Long to Short (Lactate Tolerance) that can be applied to a typical High School Season. Specifics of Design, Energy System Training, Strength Training, Sprint Mechanics and volumes of research and reference sources for sprint training can be found in Program Design Method Program for Sprint and Hurdle Training (Published 2008 by Jim Hiserman). 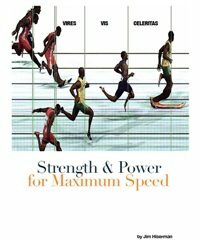 A Total Sprint-Training Program for Maximum Strength & Power, Core Strength, and Maximum Sprint Speed (5 part series). Another great article gentlemen, thank you. But can you please specify the difference between a strength day to a power day. Strength would involve Squat, Deadlift type exercises versus cleans, clean pulls, snatches, box jumps, etc. for Power.